A security researcher says he was able to hack Uber’s petition website to display a joke petition and rival Lyft’s homepage. It’s no secret that ride-sharing companies Uber and Lyft have enjoyed a spirited rivalry in recent years. Over the weekend, a security researcher inserted himself into the crosshairs of the two ride-hailing services by exploiting a vulnerability in Uber’s petition website that allowed him to showcase and redirect visitors to Lyft’s homepage, while also changing the content of some petitions. Now he’s warning the company – and others like it – to take precautions when using petition and contest websites, as they might prove to be a welcome mat for malevolent hackers. Business Insider reports that security researcher Austin Epperson used a flaw in Uber’s online petition site to show how easy it can be for a hacker to takeover a website through simple content forms. He says Uber customer information was never at risk. After discovering that an Uber petition to convince San Francisco to allow the company to operate on Market Street would accept input other than digits in the ZIP code field, he decided to find out what else he was capable of doing to the site through the contact form. In the end, he determined that the form would accept just about everything, including an iframe that allowed him to direct Uber’s petition visitors to Lyfy’s website. 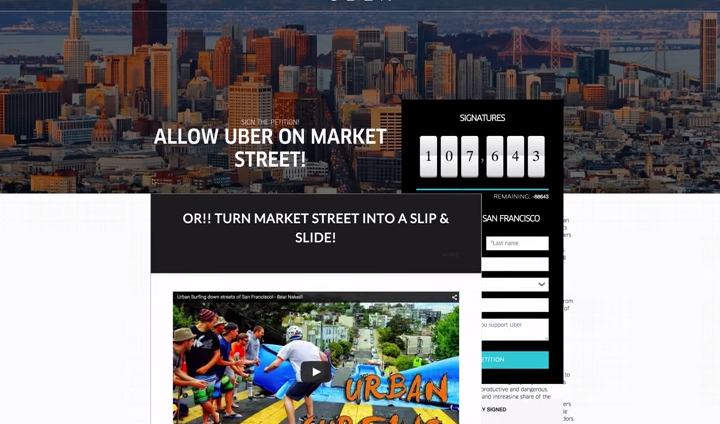 Epperson was also to create a script that automatically entered signatures on the petition at a rate of about 1,000 per minute and changed the wording of the petition to include turning Market Street into a slip and slide, Business Insider reports. According to Epperson’s blog post, the hack was live for about two hours. He says he contacted Uber about the issue and the company eventually removed all petitions for the time being. While both the hacker and Uber say that the safety of customer information was never at risk during the prank, Epperson says that someone with more sinister intentions could have caused serious damage to the site and its visitors. Uber did not immediately return Business Insider’s request for comment on the situation.